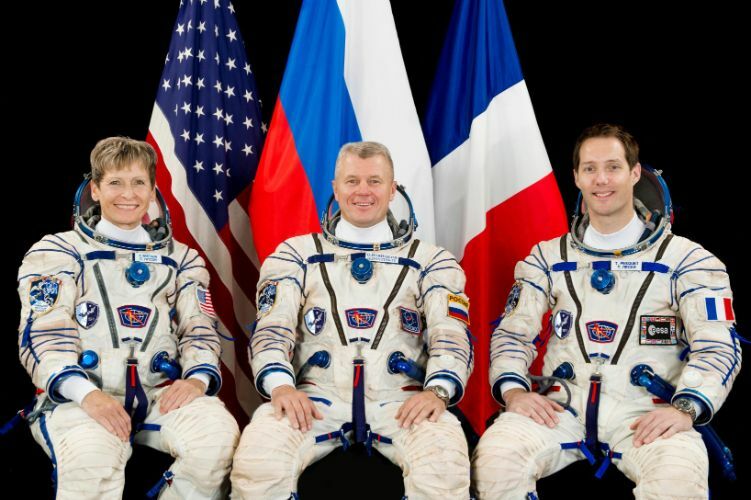 Veteran Soyuz commander Oleg Novitskiy, ESA’s Thomas Pesquet and NASA’s most experienced female astronaut Peggy Whitson climbed board their Soyuz spacecraft Thursday night when temperatures read 15 below zero Celsius at the Baikonur Cosmodrome. Their journey began with a 2:20a.m. liftoff and picture-perfect nine-minute climb into a low orbit around Earth from where their Soyuz MS-03 craft was to catch up with the Space Station. 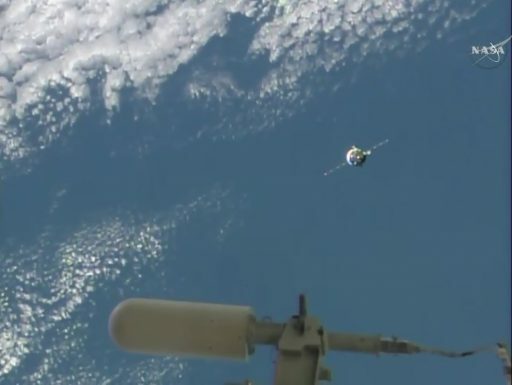 Soyuz raised its orbit a few hours after launch and again on Saturday to arrive at the Station’s doorstep for a fully-automated flyaround ahead of a straight-in approach to the Rassvet module for an on-time docking at 21:58 UTC, kicking off a 178-day stay at the orbiting laboratory for Expedition 50 and 51. 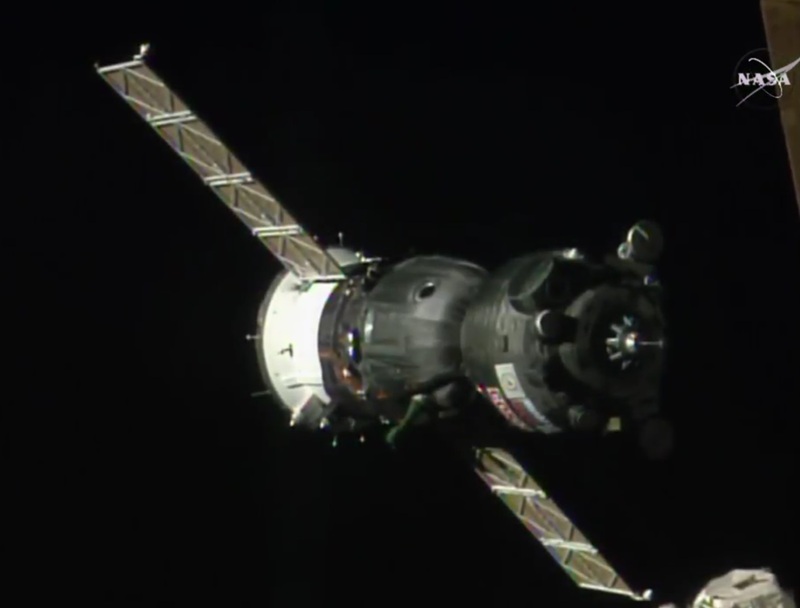 The Station’s resident crew members Shane Kimbrough and Cosmonauts Sergei Ryzhikov and Andrei Borisenko had ISS to themselves for three weeks following the October 30 departure and landing of the Soyuz MS-01 spacecraft. Joined by the new arrivals, the complete Expedition 50 crew is set to welcome a pair of visiting vehicles in December and then support at least two spacewalks for the replacement of external batteries on the Station’s truss that have reached the end of their lifetime. Soyuz MS-03 – the third in the improved series of Soyuz craft – enjoyed a smooth flight to the Space Station, lifting off from Baikonur’s historic Site 1/5 at 20:20 UTC on Thursday atop the trusted Soyuz FG rocket. Swinging to the north-east, Soyuz FG entered the standard departure path out of Kazakhstan to drop the spacecraft off in the orbital plane of the Space Station. 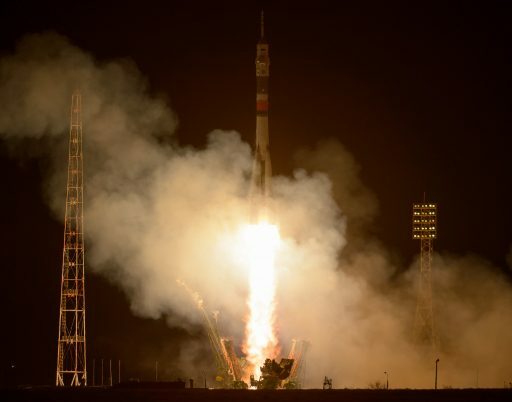 The force of raw rocket power faded to the sensation of zero-gravity eight minutes and 45 seconds into the flight when Soyuz booster shut down its engine followed three seconds later by the separation of the Soyuz MS-03 spacecraft into an initial orbit of 201 by 245 Kilometers. Still strapped into their seats in the small Entry Module, the three crew members oversaw the deployment of the spacecraft’s solar arrays and communication antennas as well as the pressurization of the propulsion system. Soyuz MS-03 conducted a pair of orbit-raising maneuvers on its third and fourth orbits of Earth, each maneuver about 75 seconds in duration, lifting the spacecraft into an orbit of 317 x 321 Kilometers where it continued to catch up with the Space Station from below and behind. Soyuz MS-03 had to take the long way round, sticking to the conventional 34-orbit rendezvous profile taking two days from launch to docking. This profile had to be used by all Soyuz MS flights to date because the ground system is not yet ready to support a six-hour, four-orbit launch-to-docking mission. To accomplish an express docking, the Soyuz has to receive updated flight parameters based on its actual insertion orbit shortly after launch – requiring a ground station compatible with the new Unified Command and Control System of the Soyuz MS spacecraft. 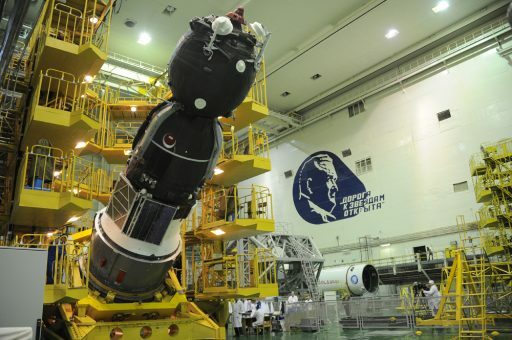 This station, located near the Vostochny Cosmodrome in Russia’s far east, recently finished outfitting and was to be tested on Friday when Soyuz MS-03 passed overhead to verify the S-Band uplink could be received by the spacecraft to clear the ground station for operational use. 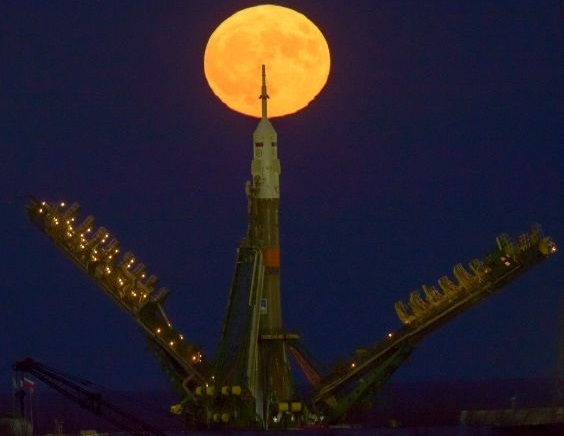 If declared operational, the ground station will be used on all subsequent Progress and Soyuz mission to provide several minutes of data connectivity in the minutes after orbital insertion as the vehicle heads over Russia and out over the Pacific on their first lap around Earth. Friday was also dedicated to a manual flying exercise, taking the Soyuz through a range of attitude maneuvers using only a subset of the vehicle DPO thrusters to demonstrate the spacecraft could be flown with some thrusters unavailable. A small orbital correction conducted Friday night placed the Soyuz on the correct path for Saturday’s rendezvous sequence. The Automated Rendezvous Sequence kicked off at 19:40 UTC with the spacecraft still trailing and orbiting 80 Kilometers below its target. DV-4, the fourth rendezvous maneuver performed since launch, was conducted just after 20 UTC and saw the 300 Kilogram-force SKD main engine firing to accelerate Soyuz by 17 meters per second and place it on a path into the 200-Kilometer communications zone around ISS. 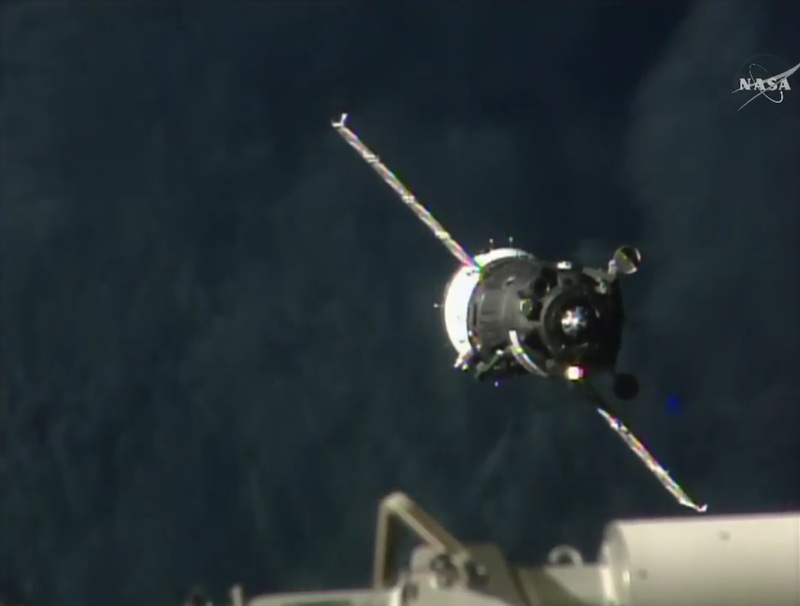 To prepare for the arrival of the Soyuz, ISS handed control authority over to the Russian Segment thrusters for the maneuver to the proper docking attitude. In addition, several systems that could interfere with the communications system of Soyuz were powered off. 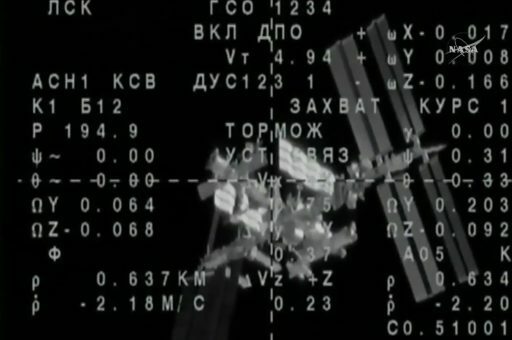 A two-way voice link was established between ISS and Soyuz to allow the Station to serve as a relay point between the Russian Mission Control Center and the Soyuz craft. The KURS radio navigation systems on the Station were powered up at 20:29 UTC followed one minute later by the KURS-NA system of the Soyuz. KURS activation marked the start of the relative navigation phase of Saturday’s rendezvous with KURS-NA first searching for the direction of the Station’s beacon before facing the forward side of the Soyuz toward the signal so that the AO-753A phased array antenna could lock onto the signal for pitch and line-of-sight angle measurements. 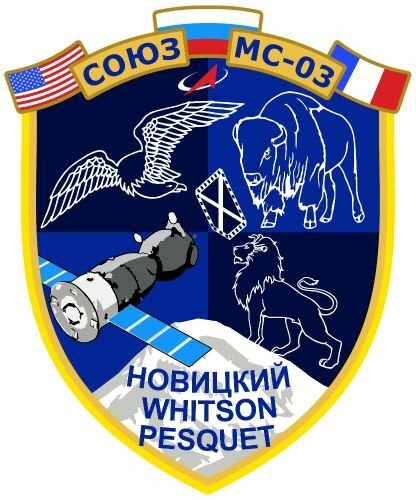 AO-753A is one of many new systems on the Soyuz MS, replacing a pair of VKA omni-directional antennas and the complex 2AO rotating antenna of the previous KURS generation. Retained from the older KURS were the two ASF-1 antennas that came into play when Soyuz was closer to ISS to provide range and range rate information in addition to the angular data. A 24.1m/s main engine burn at 20:50 UTC put Soyuz on course toward its Ballistic Targeting Point – an imaginary target one Kilometer from the Space Station. With the craft inbound on the expected path, the KURS-NA system went through a pair of tests at 45 and 15 Kilometers to ensure valid navigation data was provided. Arriving at the station’s doorstep, Soyuz entered a complex ballet of swinging back and forth between its line-of-sight orientation for navigation measurements and burn orientation for firings of the SKD for a series of three impulse maneuvers. These maneuvers reduced the intentional targeting offset to 750 meters, then to 300 meters and finally aiming directly for ISS. 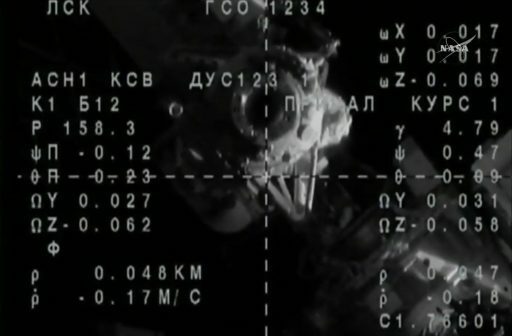 Firing up its DPO thrusters when inside one Kilometer to ISS, Soyuz hit the brakes and initiated its flyaround at 400 meters to get lined up with the Rassvet module. Relying on its KURS system, Soyuz flew a slow lap around the complex to get lined up and stare straight down the barrel of Rassvet. Soyuz paused its approach at a distance of 200 meters and rolled to position the solar arrays at the correct angle for the docked mission. Holding perfectly still, Soyuz awaited its final approach command that was given by Commander Novitskiy after only a short Stationkeeping period. Upon reception of the approach command, Soyuz gently pulsed its DPO thrusters and initiated a closing rate of 0.8 meters per second for a straight-in approach, later reducing the relative speed to under 0.2m/s for contact. Soyuz kept its crosshairs in perfect alignment with Rassvet’s docking target – requiring no outside intervention as it prepared for capture by powering up its docking mechanism. 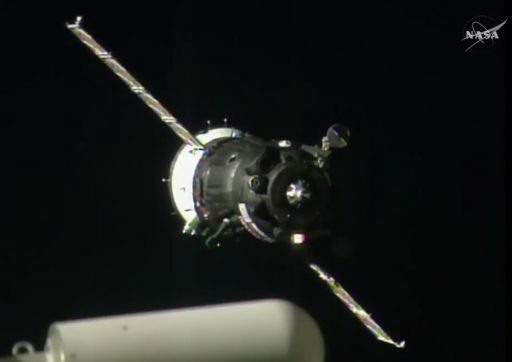 Docking occurred at 21:58:35 UTC when the complex was 400 Kilometers above the coast of Brazil, having just finished a pass over South America. Soyuz commanded its docking probe shortly after docking to pull the two docking interface together so that hooks could be closed to establish a pressure-tight structural connection between Soyuz and ISS. 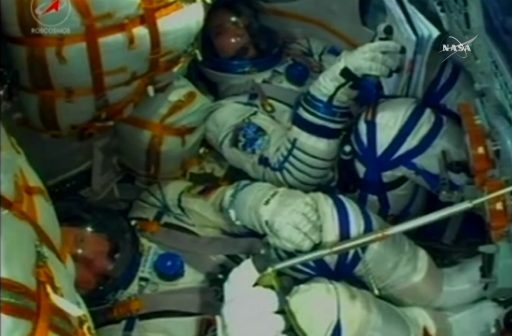 With Soyuz firmly in place, the crew was given a Go to enter their post-docking reconfiguration, transitioning the spacecraft to ISS power supply, switching to hard line comm and pressurizing the vestibule between Rassvet and Soyuz for the standard pressure check. When leak checks were complete and the crew has changed from their Launch and Entry Suits into more comfortable Flight Suits, they headed into hatch opening procedures that started with the opening of the Rassvet module hatch and pressure equalization before the Soyuz hatch could swing open and the multinational crew members could finally trade the confined space of the Soyuz with the spacious ISS modules. 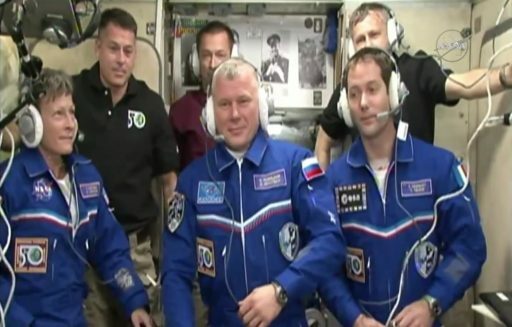 Hatch opening was marked at 0:40 UTC on Sunday, allowing two returning and one new crew member to float aboard the Space Station where they received a warm welcome by the resident crew. Cosmonaut Oleg Novitskiy returns to the Space Station after spending 141 days aboard the complex as part of Expedition 33/34 in 2012 and 2013. NASA astronaut Peggy Whitson is seeing the fully assembled Space Station for the first time, having visited the complex in 2002 when ISS was still in its infancy and again in 2007/08 when ISS was still in the midst of its assembly phase. On her two missions, Whitson spent 376 days in space, making her one of NASA’s most experienced astronauts. Back at a full crew complement, ISS is looking forward to six busy weeks to close out 2016 with operations picking up straight away as the crew prepares to send off the Cygnus OA-5 spacecraft on Monday to begin a free flight dedicated to the SAFFIRE-II in-space fire experiment. ISS will welcome the Progress MS-04 and HTV-6 cargo spacecraft in the first half of December. 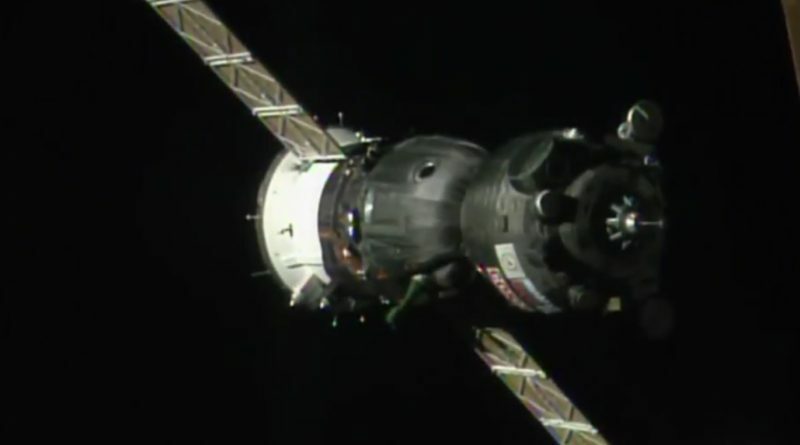 HTV-6 is of particular importance since it carries the first batch of replacement batteries that will replace the aging units that have been in operation since the Station’s truss segments were launched. The replacement will begin on the S4 truss segment and will require two or more spacewalks depending on how much of the work can be completed robotically. The EVAs are currently expected to start early in the new year depending on the progress of the HTV docked mission. Though the crew will be relatively busy with cargo moves and EVA operations, Expedition 50 is also looking at a busy science program with over 200 active studies. 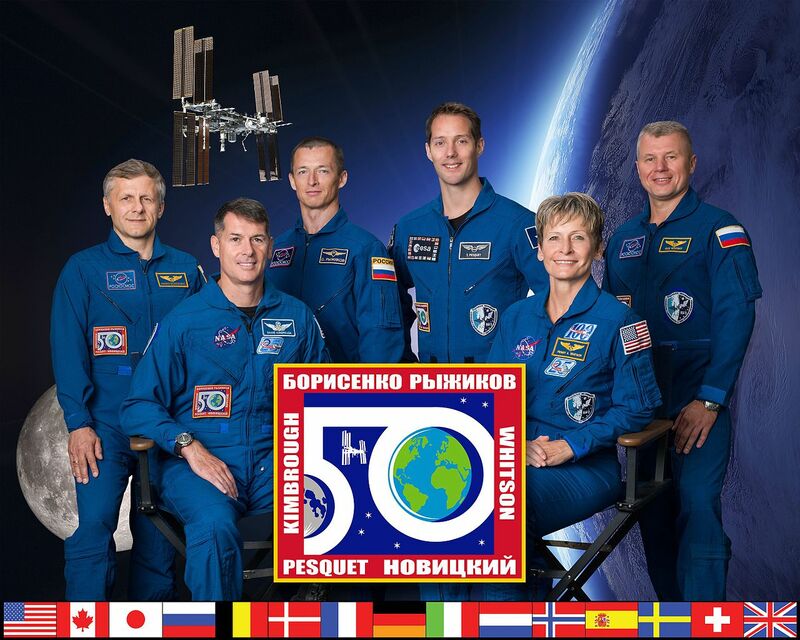 The Soyuz MS-03 crew members are booked for a stay until May 15, 2017, though the ISS schedule remains a fluid construct with frequent changes until dates are set in stone.